Here are some thoughts on the Cambridge South East Transport project, following the Queen Edith’s Community Forum meeting and the Greater Cambridge Partnership (GCP) exhibition evening. You may well have different ideas, but this is what I make of it. If you want to recap on what the project is all about, there are details here. If you’d like to see the videoed questions and answers at the public meeting, you can find them all here. 1. The ‘Strategy 3’ idea of a one-way busway from the A11 to Addenbrooke’s is a non-starter. It’s expensive for what it is; it serves the wrong side of the Biomedical Campus; and the council officers running the project think it’ll get the fewest people out of their cars. What’s more, the potential impact for the residents of Babraham Road is alarming. In my own response to the consultation, I shall be strongly opposing this. 2. These strategies were developed long before the Mayor and his consultants dumped the idea of a ‘rapid transit bus metro system’ on the city. However, Strategies 1 and 2 could work with this, by connecting their busway sections to the existing guided busway on the Trumpington side of the Biomedical Campus. If that then went into a tunnel at Cambridge railway station which led to the city, Strategy 1 might offer some sort of continuous rapid transit network from the city centre all the way out past Stapleford and Sawston to Granta Park (and one day perhaps even to Haverhill). For this reason it’s much more interesting than Strategy 2, which would terminate at Babraham Park & Ride. (The bus lane proposed from the A11 to there is one-way and could not be considered part of a rapid transit network). I’d like to see it properly landscaped to mitigate any Green Belt impact, but in my own response to the consultation, I shall be expressing the hope that the resources can be found to finance Strategy 1. 4. None of this addresses the arrival of many thousands of people starting work on the Biomedical Campus in the next year or so. It’s staggering that we’ve got so close to them moving into Astra Zeneca, Papworth and other sites with so little having been done by the authorities to cover for the period before big projects such as the new railway station and the busways can be built. The worst case of what this might mean for Queen Edith’s and Trumpington doesn’t bear thinking about. 2019 could be chaotic. 5. We need to stand up for Nine Wells and the park on the Trumpington Meadows side of the railway line. The attitude of the planners to these appears to me to see them as obstacles. The impact of these transport plans on the green spaces, Nature Reserve and wildlife must be fully mitigated, whatever the cost. As I hope most people know by now, the authorities want to hear our feedback. Everything about the South East Transport project can be found here, including ways to put forward your own ideas. If you do nothing else, complete the survey there (it’s really easy, and you can just tick ‘no opinion’ for ideas where you may not have an opinion; I did for many of those on the first page!). It seems to me that the authorities consider this to be more about the people out in the countryside who they want to get into and out of Queen Edith’s more quickly. We need to make sure that our voices are heard as loudly. Thanks Chris – good summary. I’ll be sure to respond. Thanks Chris. I agree. The only long term strategy that can support the volume of workers into the biomedical campus alone is strategy 1. Lets hope the powers than be can see this and beyond …into the city centre. I shal be responding to this effect. I was unable to attend either Queen Edith event, but I did go to the Stapleford exhibition and watch the video of the public meeting. Observation 4 is the most important and while everyone is concentrating on the 3 options in phase 2, nobody is talking about phase 1, the supposed quick wins on the A1307. These are totally inadequate: phase 1 needs a bus between Babraham Road P+R and the CBC that avoids the A1307 going instead via Shelford and Addenbrookes Road. It also needs a step change in the bus service level on the existing guided busway, the only route into and out of CBC that has spare capacity. The 3 options in stage 2 have to be considered against the background of Cambridge South Railway Station not happening for a long time because of Network Rail capacity constraints. In this context neither of options 2 and 3 are adequate because they do not deliver enough new capacity. Finally, regarding observation 5, I think that John Meed’s ecological survey shows that the land bounded by Babraham Road, Granhams Road, the railway and the CBC perimeter needs to be considered in its entirety, not just the small part that has nature reserve status. From this viewpoint option 2 has to be the most damaging because it goes through the middle not around the edge. 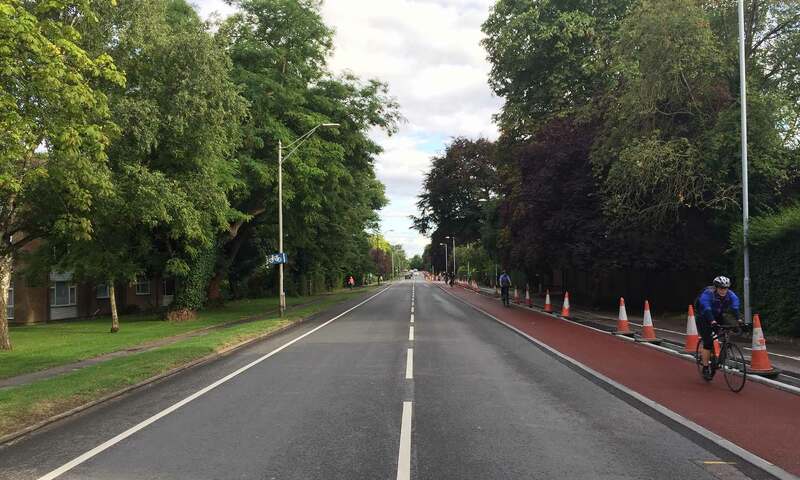 None of the options will be effective unless the free all-day car parking in the residential streets around Addenbrookes and throughout Queen Ediths is removed. Car drivers etc.will not be persuaded to leave their vehicles at the proposed remote P&R near the M11 as long as they can freely park all day in this area, particularly as the proposed improvements to the 1307 will presumably make the route easier. Previous PostPrevious Is A Busway To Queen Edith’s Coming Down The Road?